Is the Fall a challenging season for you? Do you have compromised lungs, a weak colon, or a stagnant lymphatic system? Do you harbor unresolved feelings of sadness, grief, or trauma? Do old thoughts, ideas, and emotions prevent you from moving forward? Many ancient cultures acknowledge that each season presents a “magic window” of healing, meaning that certain organs and body systems are more active and receptive to healing in different seasons. According to Traditional Chinese Medicine (TCM) theory, the organs and body systems of the Fall are the respiratory system (lungs), large intestine (colon), and lymphatic system. Furthermore, TCM theory indicates that if we treat or strengthen an organ during the season it is most active, vulnerable, and receptive to healing, we will improve and tonify the overall health and function of the organ. By removing toxins that can become stagnant and manifest into disease, and by strengthening the respective organs each season, one gradually builds radiant health and vitality. Cleansing dramatically speeds up our body’s innate ability to naturally rejuvenate itself. recommendations for season-specific lifestyle tips, hydrotherapy, aromatherapy, emotional transformation, positive affirmations, deep breathing and visualization exercises, and other complementary healing treatments. Cleansing has been practiced across the world for thousands of years for health, longevity, religious, and spiritual purposes. Holistic cleansing is a process of whole body rejuvenation and detox that embraces dietary change, lifestyle modification, specific herbal supplements, emotional transformation, positive affirmation, and spiritual growth. Cleansing is a process of transformation. If you are searching for a catalyst to improve your physical wellness, integrate new healthy habits, and experience emotional growth and spiritual fulfillment, please contact me to schedule an herbal appointment. Together, we will decide if this is the best time for you to begin the holistic Fall Cleanse. For now, here are the season-specific lifestyle tips and personal development and healing tips I recommend to clients on this cleanse. 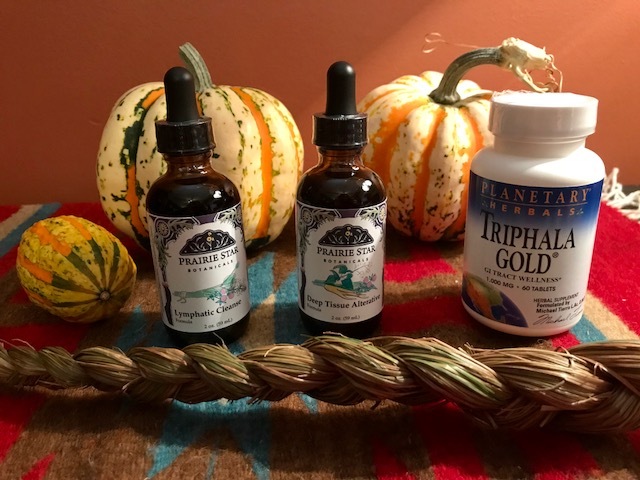 These are helpful practices for experiencing a healthy and peaceful Fall, and important components of the holistic Fall Cleanse. Start slowing down your lifestyle. The Fall is a time for relaxation, going “inward,” and preparation. This season calls us to restore energy exerted during the busy Summer, strengthen our immune defenses, and begin to prepare our resources for Winter. Embrace a slower routine while spending more time on self-reflection, meditation, and prayer. Practice deep breathing exercises outside in the crisp fall air. Perform dry skin brush massages on your skin at least twice a week to stimulate your lymphatic system. Full body dry brushes and facial dry brushes can be purchased at a local natural food store. In late Fall, wear a scarf to protect yourself from invasive winds and dampness. Do gentle, flowing exercises that circulate the blood, like yoga, tai chi, and qi gong. Take a hot bath, sauna, steam bath, or go to a sweat lodge at least one a week to help boost the body’s immune system to fend off common illnesses of the Fall. It is said that our issues become our tissues and our tissues become our issues. Energy and tissue memories of sadness and grief are stored in the lungs and can negatively affect the health of the lungs, one of the organs most active during the Fall. Fall Personal Healing Tip: Begin to release or work through harbored emotions of sadness, or grief. Energy and tissue memories of old thoughts, ideas, and emotions are stored in the intestines and can negatively affect the health of the intestines (the colon, specifically), one of the organs most active during the Fall. Fall Personal Healing Tip: Begin to let go of or resist holding onto old thoughts, ideas, and emotions. Energy and tissue memories of trauma and deep, buried, unresolved emotions are stored in the lymphatic system and can negatively affect the health of the lymphatic system, the body system most active during the Fall. If you are ready to start the holistic Fall Cleanse, please call or text 402-934-1617 to make an appointment.